Fluid Film Industrial Tank Coating and Wire Rope Dressing. Available in liquid, gel, and grease forms. Penetrates to base metal and cable core. Displaces rust. Where surfaces are heavily corroded, Fluid Film acts as a descaler. Applications of the FLUID FILM coatings have been made in numerous industries including oil refineries, paper and pulp, fertilizer and battery manufacturing plants. Environmentally friendlier with no solvents. FLUID FILM provides exceptional corrosion control for parts in storage or in shipment. 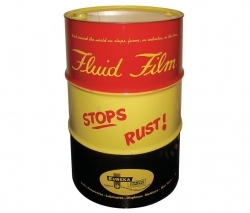 FLUID FILM also supplies long lasting protection for all metals coated or uncoated that are subject to salts, fertilizers, moisture and atmospheric corrosion. Superior rust and corrosion protection, lubricant, penetrant (conforms to mil-spec r-21006). Superior rust and corrosion protection, lubricant, penetrant. Superior rust and corrosion protection. Lubricant, penetrant - nsn #9150-00-530-6814, mil-prf-18458c (sh) amendment 5. Superior open gear lubricant, rust and corrosion protection, penetrant. Fluid Film Industrial tank coating and wire rope dressing distributed by NLS Products.